Hi Everyone, Jason’s turn to write a short post. I was recently in attendance at Dr. William Davis’s second Halifax presentation and would love to provide a short synopsis of his work. 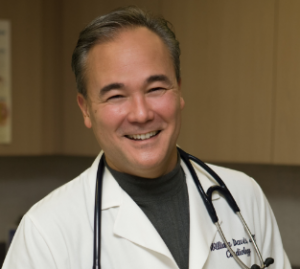 As a cardiologist in practice he has always been interested in treating the cause of disease and not masking problems with medications. 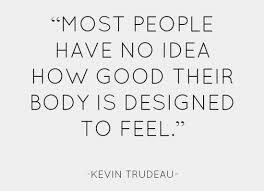 This is our philosophy as well, especially as it relates to pain and dysfunction. He started his presentation talking about mammals and what each of them would need to eat in order for them to have ideal health and how different mammals have a different nutritional requirement. For example, a lion needs meat and a cow needs grass, switch their diets and both animals would not be able to survive. So what is the ideal human diet? Well there are a million books, a million experts and a bunch of scientific studies proving one model and disproving another. He explained how the consumption of grains started roughly 10,000 years ago but our genes were not designed or ready for this shift. He feels we have been given very bad nutritional advice when government, agencies and experts say to watch fat but eat your healthy whole grains (ie: wheat). In his first book Wheat Belly, he goes into detail about all of the issues that wheat can cause in the human body. For some people (like me) that enjoy detail, I appreciated his use of examples and clinical experience with real patients. He has different chapters in the book explaining several health issues including heart disease, diabetes, weight loss, joint issues, autoimmune diseases and more. Tonight, he offered a very short synopsis of what happens when we consume grains and especially wheat. One issue is blood sugar and he makes a point that 2 pieces of whole wheat bread have a higher glycemic index that a Snickers bar. High blood sugar leads to an excessive insulin response. Over time this is what contributes to type 2 diabetes, belly fat, and increased levels of inflammation in the body. Another issue which can affect our own immune systems is the lack of digestion of certain proteins in wheat and other grains. When our bodies cannot completely digest a protein such as the wheat protein gliadin, it can affect the lining of our intestines causing them to be “leaky”. When this happens, other proteins and particles cross into the blood stream and our body will mistake it as a threat and mount an immune response. This is what happens in some cases with autoimmune disease such as rheumatoid arthritis. Phytates are chemicals that will block absorption of positively charged minerals such as zinc, iron and magnesium. He stated grain induced iron deficiency is the 2nd leading causing of iron deficiency world wide. If you are having iron issues, this is a possible source. We see many patients that respond well to magnesium supplementation for muscle cramps, poor sleeping, etc. What about addressing this potential cause of magnesium deficiency? He is also very clear to not replace wheat with high starch gluten-free items. While they may be “less bad”, it does not make them healthy. These items are high in corn starch, potato starch and corn which can also create havoc for our blood sugar and digestive systems. After removing grains from the diet, he feels the next most powerful step we can make is to optimize our vitamin D levels. He is also very supportive of having optimal gut flora (found in probiotics and fermented food), which often takes some time to rebuild. He is a huge supporter of omega-3 fish oil and specifically endorses the brand we carry, Ascenta. These recommendations would mimic our basic supplement philosophy and we carry these items at the clinic. So what can you eat? REAL FOOD. Healthy fats such as olive oil, coconut oil, avocado oil and organic butter should be staples. Vegetables should also be a staple. We recommend 8 servings or 4 cups/day. Be careful with excessive fruit intake for blood sugar reasons. Excessive fructose is not ideal for most people. 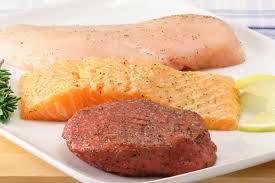 Wild fish, grass fed beef, free range chicken/eggs are quality sources of protein. Nuts and seeds are great snacks and additions. We limit dairy intake and he would advise the same (use with caution as it can also create an immune response in many people). I will likely be doing Saturday afternoon or Wednesday evening seminar to fill in some of these details and to help with implementation. If you are interested, please message us or email info@novaspinalcare.ca and your preference of Wednesday evening from 6-9 or a late Saturday afternoon from 2-5pm. Sugar- it has become a well-known fact that over the years, we as a society are consuming excess sugar in our diets. Over the holidays people over-indulge in sugary drinks and sweets laying around at gatherings. Sugar can cause inflammation in the body and can weaken your immune system. Sleep- lack of this key ingredient in our lifestyles can wreak havoc on the systems of our body. I am always shocked at the percentage of patients who begin care experiencing challenges either getting to sleep or sleeping through the night for one reason or another. Luckily, one of the side benefits of chiropractic care that we see in our patients is better sleep over time. Stress- whether it’s financial, the stress from travelling and having to be in so many places, this can be a stressful time of year for many. We typically get away from our daily routines of exercising and taking supplements which can be added stress as well. Limit sugar intake by crowding it out with healthy vegetables; you’ll have less cravings. Drink an abundance of water. Take vitamin D. Our recommendations are within the guidelines of the Vitamin D Council (adults- 5,000 IU’s/day and approx. 2,000 IU’s/day for kids). Probiotics are essential for proper digestion and affect your immune system. Take 1 capsule/day (billions of bacteria/capsule with multiple strains). Take 1 teaspoon of fish oil/day to reduce inflammation and keep your body sufficient of this essential nutrient. Last but not least, visit your chiropractor to have your nervous system cared for throughout the year. Your nervous system is protected by your spine and controls the function of every cell, tissue and organ in your body. We visited friends who made us these delightful brownies on the weekend. I came home the next day and made sure we had all the ingredients to make them. My oldest son David and I made them in minutes, placed them in the freezer for the recommended time and they were a hit. What I love most about the recipe is that it makes great use of superfood ingredients like coconut oil, cocoa, cocoa nibs and hemp seeds. Hope you enjoy! Find the recipe here by visiting the wonderful blog Oh She Glows Raw Brownies. Until a few weeks ago, I thought making my own almond milk was a little too much work. Watch this clip on how easy it is to make your own almond milk. The milk tastes much creamier than the store-bought one and has no preservatives. Send me an email if you’re in the Halifax region and you need me to order you a nut milk bag. I will have some at the clinic soon. This is a clip of the boys and I doing our morning routine. Many times I have patients tell me they don’t have time to take their essential nutrients. I recommend individuals do it at a consistent time every day especially if there is more than one person involved so the whole family can remember. It is so much easier to stay healthy than it is to take care of a health issue when it arises. Performing this daily routine can create enough momentum in your body to keep you and your family well throughout the year. Our family was blessed a few weeks ago with the addition of a new baby boy, Peyton Jay. 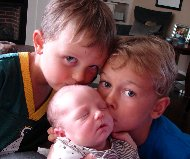 This picture was taken during his first week and it’s evident his brothers are so in love with him. It’s been a crazy busy summer with a new addition and getting used to life with 3 boys. One of the things I have made time for despite the busy times is staying on top of eating well and making sure we are all taking our required daily nutrients. 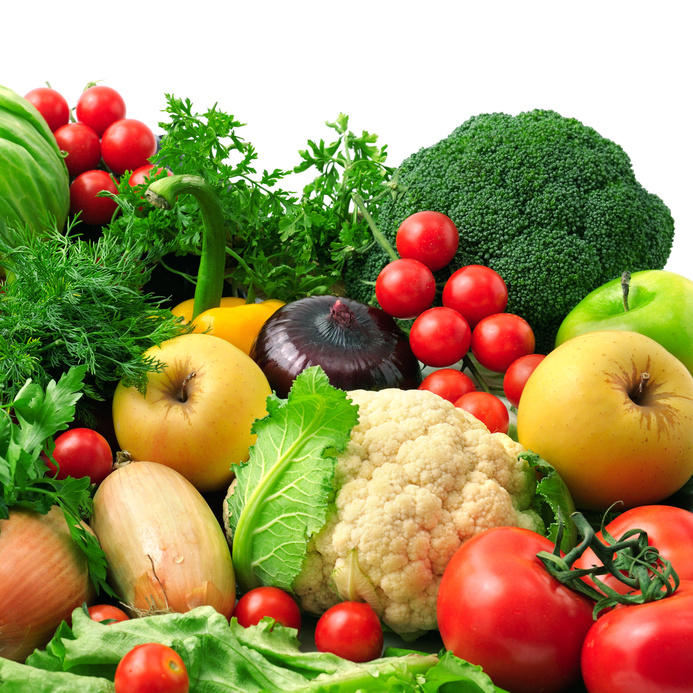 Summer is one of the easiest times to eat healthy since there is lots of fresh produce grown locally. When you can make great salads, steam fresh veggies and pair it with local grass-fed meats on the BBQ, it becomes easier to eat well since it tastes so delicious for the entire family. Get your spine and nervous system checked by a chiropractor regularly- (The strong connection between the nervous system and the immune system is why chiropractic patients dating all the way back to the 1918 flu epidemic had a startling better chance of survival than those who sought medical care). Our family gets checked anywhere from weekly to every 2-3 weeks. We know our kids need to get adjusted by their mood and disposition at times. If they have more bad falls during a particular time, we check them then as well. Other than needing stitches for my 3 year old from a fall, the kids have never had drugs or required any medical care. Prevention in our family is key, it makes life easier for all of us. Take probiotics daily- One capsule is all you need but make sure it has billions of bacteria/capsule. You get what you pay for with these products so make sure you get a good product. This will help boost your immunity by lining your gut with the bacteria needed to properly digest food and absorb the nutrients from your food. It will also help crowd out harmful bacteria and yeast. My 3 year old gets it every morning in his Greens drink when I break up the capsule and he stirs it in with his straw. My 5 year old can now swallow the capsule on his own. Take Omega 3 fish oil daily- I give each of the kids 1 teaspoon/day and take 2-3 teaspoons for me. The fish oil contains DHA (required for proper brain function) and EPA (excellent to reduce inflammation in the body). These are required nutrients in the body and if you’re not supplementing, it’s likely you may be deficient. Take it now to ensure you are getting enough for you and your family. Take Vitamin D daily- If you live in a Northern climate like Canada, you will likely require supplementation every month other than July – September. If you are blocking the sun with sunscreen or not getting exposure during the day especially if you work indoors, then supplementation may be necessary even during the summer months. The best way to find out the exact amount is to get your vitamin D level tested by your naturopath or medical doctor. We recommend 2-4000IU/day for kids and about 5,000IU/day for adults. This may differ depending on what your current levels are. Cut down on sugar- This may seem difficult at first but when you gradually reduce yours and your family’s sugar intake, everyone’s taste buds change and sweetness then becomes relative. You start craving less sweet stuff and when you do taste something less sweet, it becomes enough instead of the vicious cycle of needing more and more sugar. Your immune system will benefit immensely and hyperactivity in kids reduces dramatically in some cases with this reduction. It certainly seems like this is difficult to fit in on a daily basis but we get our essential 3 nutrients in at breakfast. It takes us a couple of minutes max to do it daily. When we take the time to stay healthy, it pays big dividends in the fall and throughout our long winters since we have healthier, happier, more vibrant families. The key for us is to talk to our kids about where food comes from. We explain to them how healthy and strong their bodies grow with better food and have them help us make informed decisions about what we eat. They love it when it’s their idea rather than just telling them that is what they have to eat. Ever notice how so few kids have runny noses in the summer compared to winter? Most of us can also feel a distinct difference in our mood and in those around us when the sun finally comes out after a long gray winter. There is something to be said about the sunshine. A few weeks ago I attended a Vitamin D Symposium at Dalhousie University. It was very informative and I’ve been telling my patients all about it and its importance ever since the seminar. Everything from bone health, stronger immunity, mood elevation, different cancers, diabetes, headaches, achy body, MS, etc… has been shown to be linked to vitamin D levels in our body. Vitamin D is an essential nutrient, are you getting enough? What is it? Considered to be “the sunshine vitamin” since it can be synthesized in the body with adequate exposure to sunlight. It is required for proper functioning of the repair mechanism in the cell. It acts as the key that unlocks the DNA library. Without this essential nutrient, chaos can result in the cell as it tries to reproduce itself to make the body thrive in its environment. Where do I get vitamin D? 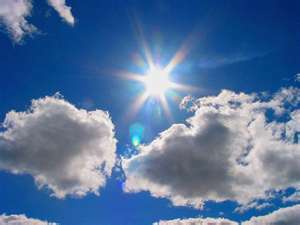 Sunshine is the most natural source of vitamin D, mainly the UVB exposure. There are many factors that influence how much vitamin D is produced in response to UVB exposure. The most well-known factor is the angle of the sun’s rays. Time of day, season, and latitude all determine the amount of UVB that reaches your skin. When the sun’s rays enter the Earth’s atmosphere at too much of an angle, the atmosphere diffuses (blocks) the UVB portion of the rays. This occurs during the early and latter parts of the day, during the winter season (what is called “Vitamin D Winter”), and increases as one moves further away from the equator. 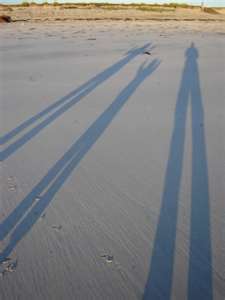 A good rule of thumb is: If your shadow is longer than you are tall (an indicator of the oblique angle of the Sun), you are not making much vitamin D.
Time of day: For vitamin D production, sun exposure should be midday between the hours of approximately 10am-2pm. These hours will vary slightly according to latitude. The closer to solar noon, the more vitamin D produced. Season- Vitamin D Winter and latitude: What latitude you reside at will affect the length of your Vitamin D Winter. Vitamin D Winter is when no vitamin D production is possible due to the atmosphere blocking all UVB. This lasts for several months, with the duration of time increasing as you move further from the equator. For many of us living in the Northern US and Canada, our Vitamin D winter can be as long as from the end of September to May. Many people tell me they are outside a lot in the winter and get adequate vitamin D from that exposure. Unfortunately, even if we (at our latitude) were fully exposed all winter, we would get minimal if any vitamin D from the sun during that vitamin D winter season. How long should I be outside? In an optimal environment (middle of the day in the summer) a light skinned person wearing a bathing suit will make about 15,000IU’s of vitamin D in 15-20 minutes. Darker skinned individuals can do the same, but it will take twice as long. The body will stop its production of vitamin D through a feedback loop after about 15,000IU’s. What is the effect of sunscreen? Sunscreen blocks UVB and prevents the manufacture of Vitamin D. We have been warned so much about the dangers of skin cancer that we often forget that over the last century we have been steadily decreasing the amount of time we are spending outdoors. Fewer and fewer people are working outdoors, more people are working in offices. More individuals have been wearing sunscreen than any other time in history. Yet, the rates of skin cancer are steadily increasing. One of the things we definitely want to avoid is getting a sunburn. When we go south in the winter with the kids, after having been away from strong sunlight for so long, we are usually very pale. We bring a natural sunscreen with us (with ingredients we can pronounce) from Burt’s Bees, Aubrey Organics etc… We allow ourselves to go out for 10 minutes or so until we feel the skin get a little warm. We then apply a natural sunscreen or apply more clothing so we can avoid burning in the first few days. Over the week, our body gradually acclimatizes to the new environment. We can then make sure we are getting adequate exposure to provide our body with the ability to naturally produce vitamin D.
~ Dr. Frank Lipman, internationally recognized expert in the fields of Integrative and Functional Medicine and practicing physician. Does the body have to process vitamin D before it becomes active? The body converts vitamin D, whether by mouth or made in the skin, to a compund called 25-hydroxyvitamin D 25(OH)D. This compound circulates in the blood and is the measure physicians or scientists use to assess vitamin D status. 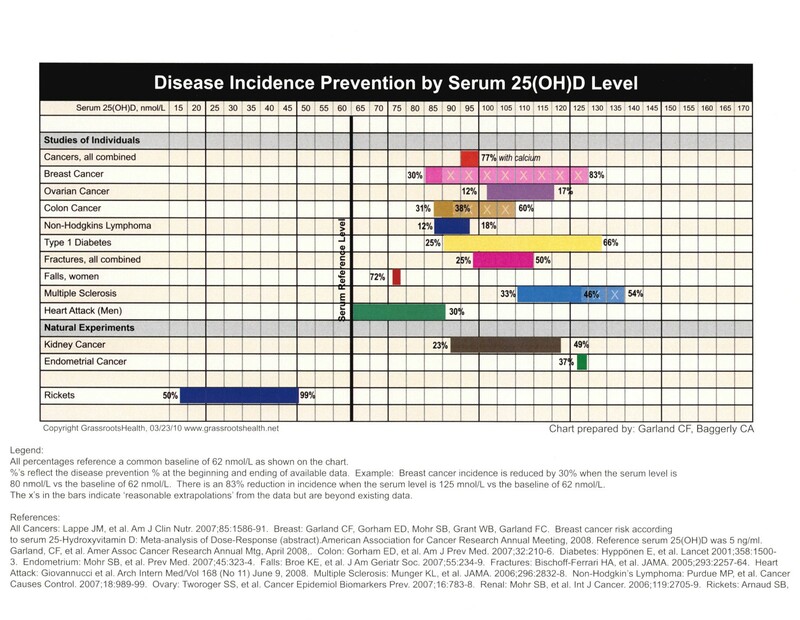 High levels of serum 25(OH)D show that you are getting enough vitamin D, while low levels indicate deficiency. How much vitamin D do I need? One of the only ways to determine for sure if you have adequate levels of vitamin D is from a blood test. You can request one from your medical doctor or naturopath. Once you get your results, ask them for the exact number because you want to be somewhere between 100-150nmol/L (40-60ng/ml in the US). The following chart will show you that for the purpose of avoiding rickets (bone deformities caused by lack of vitamin D) you want to be above 50nmol/L (20ng/ml). If your levels are 130 and above, you can decrease your chance of breast cancer by 83%. It is important to take what is necessary to not only keep you above the rickets zone but in the cancer and disease fighting zone. That is where I choose to be and it has taken me a dosage of about 12,000IU’s/day this winter to get at 153nmol/L. I am not recommending you take this much but if you are deficient (in Canada, 97.7% of individuals are below 125nmol/L and 90% are below 100nmol/L), it is important to adjust your levels accordingly. That is a lot of people who are deficient by these standards. When you do start supplementing, your levels may spike more at the beginning and then slowly over the next few months. It can take from 3-6 months to get your levels back up to the desired range. If you don’t have the opportunity to get tested any time soon, you can take about 5,000IU/day as recommended by the vitamin D Council. That is a good place to start. How much do I need to take during pregnancy? There isn’t a more important time to be sufficient in this essential nutrient than during a period where your body is literally making another human. Once again, it is ideal to achieve the same levels of sufficiency of 100-150nmol/L. It may just require a little more to do so since the demands in your body are higher during pregnancy. Taking vitamin D supplements during pregnancy is not only safe for mother and baby, but also can prevent preterm labor/births and infections. If you’re not getting tested, take the recommended dosage by the vitamin D council of 5,000IU’s/day. Is Vitamin D safe? When consumed in reasonable quantities, it is not only safe but essential to the proper function of every cell in the body. It is instructive to know that outdoor workers have levels of 150-200nmol/L (60-80ng/ml) by the end of summer. If taken in abnormally high doses, vitamin D can produce severe toxicity in the body. There have been no reported cases of toxicity below a dosage of 40,000IU’s/day or a blood serum level of 500nmol/L (200ng/ml) . What about calcium and vitamin D? Vitamin D enables the body’s regulation of calcium absorption. Inadequate intake of calcium or vitamin D will lead to insufficient calcium absorption. Be sufficient in vitamin D so you can absorb the calcium from your food. Is it important to take vitamin D daily? As long as the total dose is sufficient, vitamin D does not have to be taken every day. Some doctors prescribe weekly or monthly dosing. The important thing is to achieve and maintain a range of 100-150nmol/L (40-60ng/ml). I usually tell my patients to take their top 3 essential nutrients (vitamin D, omega 3 fish oil, and probiotics) together on a daily basis so they will remember and make it a habit. 15 minutes with as much of the body exposed as possible in a light skinned individual can produce up to 15,000IU’s. For darker skinned individuals, it takes twice as long. If you are in a Northern climate or not getting outdoors for sufficient amounts of time to naturally produce vitamin D, then supplement to get your body sufficient (between 100-150nmol/L). This dose may vary widely but a good place to start is 5,000IU’s/day according to the Vitamin D Council. Get tested by your doctor or naturopath to determine what your exact levels are. For kids, they should be within the same range as adults and since their bodies are smaller, they may require less. One rule of thumb is 75 IU/kg of body weight/day. For instance if your child weighs 20kg, an amount of 1500IU/day may be sufficient.